With the holidays drawing near, it seems as if people are always stopping in. I like to have a batch of these waiting in the freezer for those impromptu visits or the potlucks you forgot to make something for. I also love to enjoy them on those blustery nights when you're feeling like something sweet after dinner. 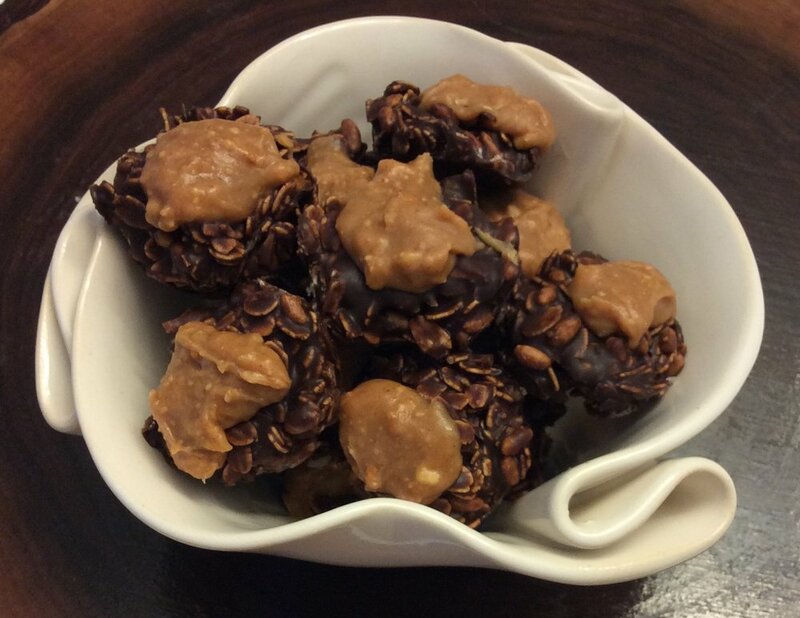 This recipe is slightly adapted from A Couple Cooks' Bliss Bites-Healthy No Bake Cookies. Things I loved about this recipe was, first of all, I actually had all of the ingredients lying around = no searching for that one hard-to-find ingredient. I love that it is refined sugar free, and provides a good dose of healthy fats that help you to feel satisfied even after having just one. It is also friendly for those with gluten, dairy, or egg sensitivities. This recipe doesn't even require turning on your oven, and takes less than 15 minutes from start to finish! What's not to love? Combine above ingredients (except for the rolled oats, coconut flakes and brown rice crisps) together in a small saucepan on low heat. Once combined remove from heat and fold in the oats, coconut flakes, and brown rice crisps. Spoon this mixture into 18 mini-muffin tins greased with oil. Pop in the freezer while preparing the topping. Combine above ingredients together (except for the sea salt) into a small saucepan on low heat. Once combined spoon on top of the base mixture and sprinkle sea salt on top, if desired. Freeze until set & store in the fridge or freezer. For some, pumpkin spiced lattes is their sign that fall is here, for me that item is butternut squash soup. There is something about that deep orange colour, and the warmth it brings with each spoonful. As the leaves start to turn, this is one of my favourite dishes to make! Often times I will make a double batch and freeze some for an especially blustery day. Serve as a side dish or the main event. First step is to tackle the butternut squash - the most cumbersome of all the steps. The good news, once your done, it's smooth sailing! I like to peel my squash first with a vegetable peeler. Then I cut it in half, and scoop out the seeds. After this, you just have to cut it into cubes and you're all set! Saute the onions in the butter or oil in the bottom of your pot until tender. Add the curry powder to the onions and saute for 1 minute. Add the rest of the ingredients to the pot and bring to a boil. Once boiling, cover the pot and reduce to a simmer for 20 minutes. Blend the contents together until pureed and enjoy! Add more curry powder to taste or season with pepper or parsley. Voila - sunshine in a bowl! I always look at recipes and wonder how we can keep the taste, but tweak it to get more bang for your buck in terms of nutrition. We often have an easy time eating grains in our day to day diet, but what about those vegetables? It is recommended to eat 5-8 servings of vegetables every single day. Vegetable consumption has been shown to reduce your risk of certain cancers, and cardiovascular disease. Doesn't that sound like something everyone would want?! If you count, it might be difficult to even make it to 2-3 servings of vegetables in a day. If you are eating 1 serving at supper and 1 serving at lunch, that's still only 2 servings! As far as I'm concerned starting early, and sneaking vegetables into as many meals as you can, is a great way to start to reach these goals. To me, this is the easiest way to eat cauliflower. It cooks quickly, minimal chopping time is required, and can go from fridge to table in 10 minutes. Cut half or all of the florets off of the cauliflower, and discard the green portions. Place them all in a food processor. Blend until small "rice-like" pieces have formed. Place on a frying pan with some cooking oil. Serve either as a side dish, or as the rice for your favourite dishes like butter chicken or even stir fry. Sometimes I just get tired of reading labels, looking over every single ingredient, and calculating nutrition facts. When I get frustrated trying to find foods without added sugar or certain ingredients, I usually retreat to my kitchen. In this busy world, I still try to make as many things at home that I can. This way I know exactly what is in the foods I am eating, and if I want to avoid certain ingredients - I can! Breakfast is usually the most challenging meal for people, as we are bombarded with sugary cereals or just plain old refined carbohydrates that leave you hungry an hour later. While I do love some hearty oatmeal, once that summer sun hits I just can't bear eating oatmeal for breakfast. Thus - this do-it-yourself cereal was born! wide-mouth mason jar or glass bowel and add 1/2 cup of almond milk when ready to eat. Mix and match ingredients as you like. You can substitute in sunflower seeds, walnuts, chia seeds, hemp hearts, dried cranberries or other fruits as you desire. The above is a single serving, so you can increase the amounts depending on the size of batch you want to make. I like to make enough for a week in mason jars and keep them in the fridge for a quick and easy weekday breakfast! I don't know about you, but eating healthy often feels like a challenge that will take more WORK and more TIME. The two biggest obstacles stopping people from changing eating habits is that it is "too hard" and they have "no time" - a seemingly insurmountable combination. So, my goal is to find ways to make your life easier, and those healthier meals less time consuming. Enter one of my favourite kitchen tools - the slow cooker! I have always loved the idea of spaghetti squash, it's a vegetable, that when cooked, comes out like spaghetti noodles - what's not to love? However, it can be quite the task to cook. From cutting the hard-as-rock squash in half, to making sure you have enough time before the meal to bake it - and if not, it can be quite difficult to scoop out. That's all fine and dandy if you A) have the time and B) have some patience. If not, here's a way to avoid those challenging steps - set it & forget it. Carefully pierce some holes into the spaghetti squash with a fork or knife, and then place it whole in the slow cooker. Add the water, and set on low for 6 hours. Afterwards: carefully remove the spaghetti squash from the slow cooker (it will be hot! ), cut it in half, scoop out the seeds and discard, and then scoop the rest of the squash out with a spoon - it should easily peel away from the sides. Serve it as a side with a meal, or serve it as the main dish with your favourite pasta sauce, a protein, and some veggies. My favourite combo: pesto with shrimp, peppers, broccoli and mushrooms! Weekend breakfast, two words that just fit so seamlessly together. There is something about waking up on a Saturday morning and ditching your Monday to Friday routine of oatmeal, and splurging for something more exciting! I have always loved the idea of waking up on the weekend to waffles, the smell wafting through the whole house, and drizzling local maple syrup on the finished product. However, 1 hour later that hunger often returns and the deliciously fluffy waffle was just not sustainable. They just don't quite pack the nutritional punch that other breakfasts provide. When it comes to waffles, I have been searching for a way to "have my cake and eat it too". To have a nutritious breakfast that fills me up, but also satisfies that craving of kicking your routine to the curb, and bringing some more excitement into your weekend! It took a year of ironing out recipes and changing the measurements to finally find the right combination of ingredients, but I have found it! This recipe makes me feel like I am eating oatmeal and eggs for breakfast, BUT in the form of a tasty and fun waffle. It doesn't get much better than that - bring on the weekend! Preheat your waffle iron. Add all of the ingredients together into one bowl, mix, and pour onto waffle iron when ready. Remove when golden brown (time varies with each machine). Add 100% pure maple syrup and peaches or berries. Yields 4 small square waffles, feeds 2 people. I don't know about you, but I LOVE granola bars! I love that they are easy to pack in lunches or as a quick snack on the go. I love that they feel like a treat but I can even eat them for breakfast. What I DON'T love about them, is that they can be loaded with sugar, high fructose corn syrup, and artificial colours. Many granola bars contain over 30 ingredients, some of which I have a hard time pronouncing. This is where energy balls save the day! They are easy to make, take less than 10 minutes, and you don't even have to turn on your oven! One bowl, one spoon, no bake, no fuss. They are a quick snack to keep you going on those busy days throughout the week, or a treat in the evening for a hint of sweetness after supper. When these are in my house, I don't miss those beloved granola bars. *Can substitute for more oats. Otherwise, brown rice puffs can usually be found at a bulk food store. Mix together and let sit in the fridge for 30 minutes (they roll easier this way). Then roll into golf ball size, and store in the fridge. Yields 12-16 balls.